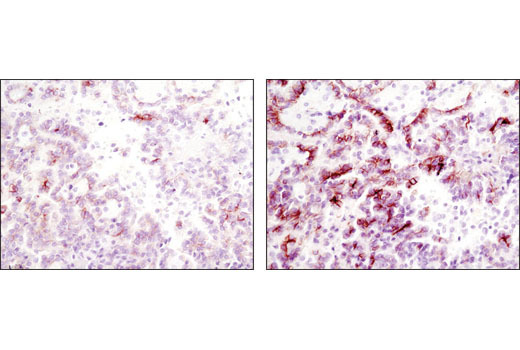 Immunohistochemical analysis of paraffin-embedded human lung squamous cell carcinoma using Sox2 (D6D9) XP® Rabbit mAb #3579 with biotin-based detection (left) or SignalStain® Boost IHC Detection Reagent (HRP, Rabbit) (right). Immunohistochemical analysis of paraffin-embedded human papillary renal cell carcinoma using Phospho-Met (Tyr1234/1235) (D26) XP® Rabbit mAb #3077 with biotin-based detection (left) or SignalStain® Boost IHC Detection Reagent (HRP, Rabbit) (right). Equilibrate SignalStain® Boost IHC Detection Reagent (HRP, Rabbit) to room temperature prior to applying to the slides. Cover sections with 1-3 drops (40-120 µl), as needed, and incubate in a humidified chamber for 30 minutes at room temperature. Wash slides and develop with any peroxidase-based substrate. SignalStain® Boost IHC Detection Reagent (HRP, Rabbit) should be stored at 4°C and is stable for 12 months. 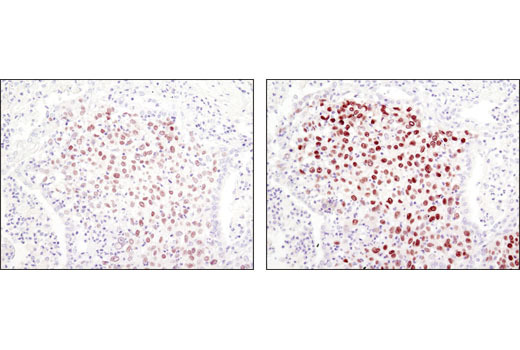 SignalStain® Boost IHC Detection Reagent (HRP, Rabbit) is a ready-to-use solution intended for use in immunohistochemical assays to detect rabbit primary antibodies. SignalStain® Boost IHC Detection Reagent (HRP, Rabbit) is a highly sensitive, one-step, polymer-based detection reagent that is specific for rabbit IgG. It can be used to visualize targets in both paraffin-embedded and frozen tissue sections and it is compatible with all peroxidase-based substrates. SignalStain® Boost IHC Detection Reagent (HRP, Rabbit) can be used to detect rabbit primary antibodies in immunohistochemical assays. Some antibodies may require titration when used with this highly sensitive reagent.